What beings as a standard dueling game quickly turns into a sprawling adventure across four very unique worlds. It may not be overflowing with content, but Cold Iron has a really unique hook. Let’s find out if it should win a duel with your wallet. The story in Cold Iron starts like any great western. An absolutely incredible narrator delivers an authentic performance while still images accompany the opening cutscene. You are the son of a gunslinger who was known for putting bad guys in the ground. While he put those days behind him, his past caught up with him eventually. Now, you’ve dug up his old gun and you’re setting out on a quest for vengeance and answers. The game’s story is divided into four worlds with several duels each. The first world is pretty standard western-style fare, but the game’s story soon shifts into science fiction, fantasy, and even horror. Surprisingly, this all works pretty well. The game’s story manages to explain the sudden shifts, and with the narrator’s amazing voice acting, I never once questioned it. I don’t want to spoil the reasons why you go on this sprawling adventure, but I will say that the story kept me interested throughout. I would have liked more cutscenes, more backstory, and more of that excellent narration, but the framework here is very solid. It’s not a very long story, you can probably finish it in an hour or two, but it has a very solid beginning, middle, and end. A mash-up of completely different genres and settings like this shouldn’t work, but thanks to a clever story and convincing voice acting, I was completely invested, regardless of where the game wanted to take me. 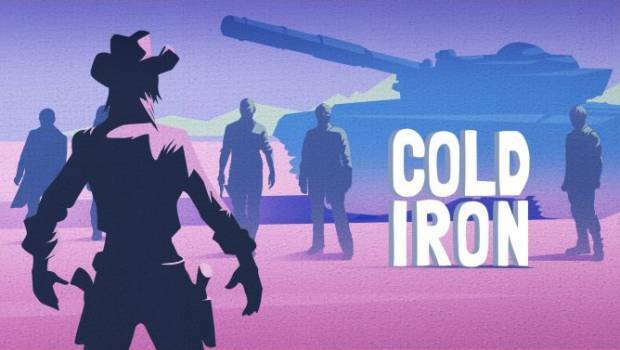 Cold Iron has very simple controls, but it easily falls into the category of “easy to learn, hard to master.” You’ll play the game with a single PlayStation Move controller, tilting down to holster your gun, and firing with the trigger when the time is right. The first world gets you acquainted with the concept. When the bell rings, you draw your gun and pray you get a shot in before your opponent. As the game delves into subsequent worlds and duels, your skills are pushed to the limit. 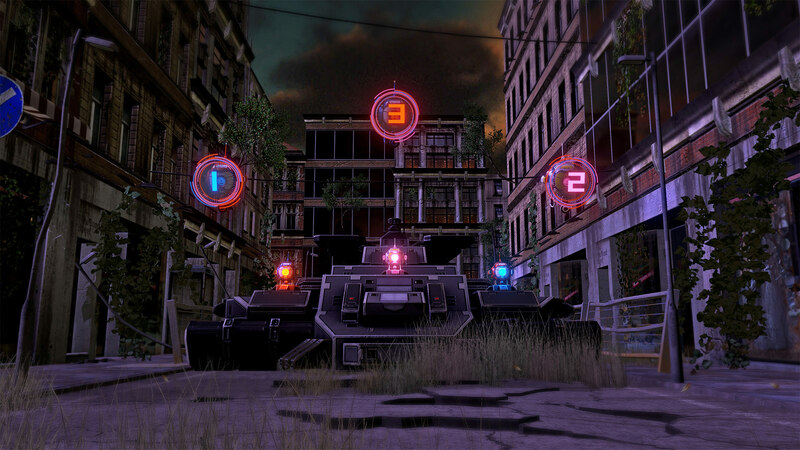 Soon you’ll face enemies that teleport around, clone themselves, and much more. The use of colors is very prominent in many of the duel solutions. If you look carefully, you can spot hints during the duels that help you predict where your opponent will be or who they will be, but time is short. This constant change of mechanics and strategy makes each duel very unique. The difficulty does tend to ramp up pretty quickly, so be ready for a curve throughout the story. Bonus stages break up the action, but unfortunately they are all the same variation of shooting flying watermelons. 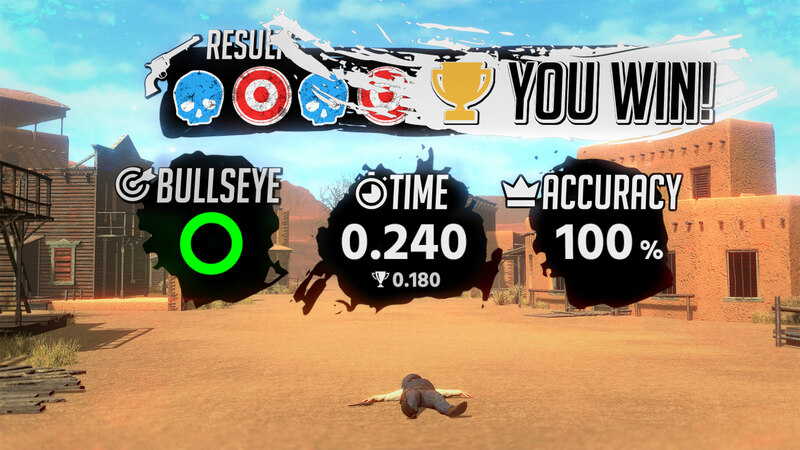 The only part of the game that was really frustrating for me was the checkpoints. If you fail too many times on a duel, you have to restart the whole world. This seems like a punishing cost for a game over as it then requires you to do every duel over again up to that point. It’s not a big issue if you’re stuck on the first duel of the world, but if you make it to the boss, it can be grueling to fight your way back again. This punishment for failure does extend the game’s length somewhat, but it seems too harsh for me. The wide variety of enemies and locations between the worlds keeps things very interesting. When you finish the story, you’re also encouraged to earn silver or gold statues for each of the challenges as it will unlock a final duel. This end game challenge offers some replayability. It may be on the shorter side for the asking price, but Cold Iron has a great story and a strong mechanic in place. It’s easy enough for anyone to pick up and play, so I could imagine it being fun at parties if you bring out the VR headset. There are aspects of Cold Iron’s presentation that I really enjoyed. The slick art for the cutscenes and the superb music were high notes for me. The enemy designs were unique and wholly unique between each encounter. The game only really suffers in its environments. While they do tend to be extremely different from the world prior, they lack detail and clarity in VR, especially at a distance. Despite this qualm, I really love what this developer has done with Cold Iron. It’s not perfect, but it has a lot of great ideas that make it worth playing. If anything, I recommend buying it to support this talented studio, and you’ll get a really unique VR title in the process. I can’t wait to see what ideas they come up with next.